Chicago-style steakhouse conveniently located next to Anaheim’s Convention Center and The Disney Resort. 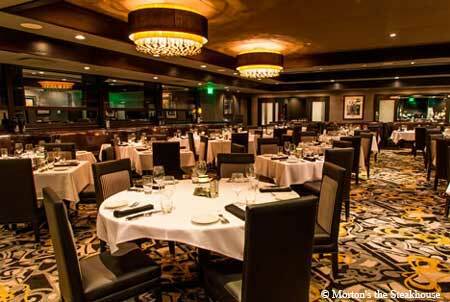 : This Morton’s The Steakhouse outpost is located within walking distance of the Anaheim Convention Center and its nearby Marriott and Hilton hotels, as well as Disney’s California Adventure and Disneyland. Even though it is a bastion of beef, virtually all the appetizers come from the ocean --- giant sautéed shrimp, broiled scallops, crab cakes and lobster bisque. Some diners begin their meal with greens, whether it’s the crispy “wedge” salad with a tangy blue cheese dressing or the more traditional Caesar. Steaks are all well-aged Prime beef. The Cajun-spiced rib-eye is particularly flavorful, and a good match with a side of creamed spinach or asparagus. One of the most tender --- and most expensive --- cuts is the porterhouse, which feeds two and is prepared tableside. As for desserts, pick the traditional New York cheesecake, along with Morton’s signature coffee. The long wine list has some rather good by-the-glass selections, and beer aficionados will enjoy exploring the solid collection of Trappist brews. Late-night happy hour at the lively bar offers pub-style bites --- a popular option for Angels fans looking for post-game grub.